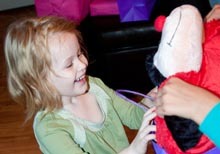 A few months back my Ladybug saw a commercial for a Pillow Pet. I’m going to venture that if you have a child under the age of about 8 not only have you heard of them, but you have no doubt been begged to purchase one. Ladybug begged for about three months and finally for her birthday we caved. Well, technically we let someone else cave. Regardless, she got herself a pillow pet. A ladybug pillow pet no less. The moment was joyous. And to make it even sweeter, the first thing out of her mouth was, “Mommy, my pillow pet is machine washable! !” After busting my gut laughing, I got to thinking about how sensitive my 4 year old is to advertisements. We don’t watch a ton of television here, but clearly what we do watch sticks. …I am smart enough to know that they are just doing their job. Therefore, I need to step up and do my job. I have yet to come up with a brilliant idea to shelter my children from advertising. For the time being, I just DVR her favorite show, and skip the commercials. That seems to work, yet I realize that it’s not just the TV that is attacking her. 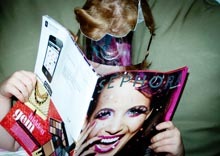 As you can see she raided my mail pile and found my Sephora catalog. I do admit to loving me some Sephora. She tells me, “Mommy, this is the most girly princess magazine!” Is she ever right about that. Even though my first reaction is to be angry with the advertising companies, I am smart enough to know that they are just doing their job. Therefore, I need to step up and do my job. Teach my daughter how to understand what an advertisement is, how they work, and even more importantly how to end up as a smart consumer. Have I got my work cut out for me or what? This convinced me to buy a pillow pet! Thank you.